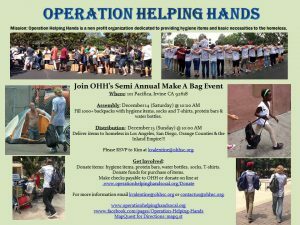 It is time for the winter Operation Helping Hands project. The two day event will take place December 14 and 15. We are aiming to fill and have our youth deliver 1000 backpacks directly into the hands of our homeless. This is certainly a far cry from the 50 target bags we started with just 3 years ago. It has only been with your generous help and support that we have been able to make this happen. What is new this year???? First off, Operation Helping Hands has added yet another county to our project. We are proud to announce that in addition to Orange County, San Diego County and Los Angeles County, we will also be servicing the Inland Empire. Please consider how you can help. Donate goods including blankets, hygiene items, protein bars, water or sweatshirts. Donate funds to purchase the backpacks and goods to put in them. Visit our donation page or send checks to VLG made out to Operation Helping Hands. 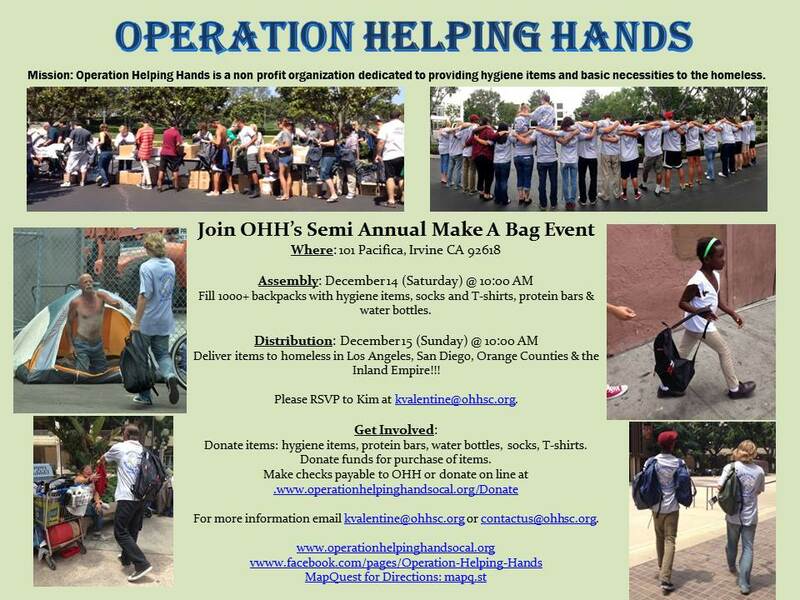 Saturday: December 14, 2013 at 10:00 ~ Help assemble backpacks and pack them in vehicles. Assembly will be in the VLG parking lot. Sunday: December 15, 2013 at 10:00 am ~ Meet in VLG parking lot and caravan to any one of the many counties we service. Bring age appropriate kids/teens to make and hand out the backpacks to the homeless. It is a rewarding experience for all. Trust me. Not only do we touch 1000 lives with the backpacks we deliver, we touch the hearts of the kids involved in giving. Not everyone is impacted the same way. And certainly I can always tell that some are touched and affected more than others. It is written all over their faces and in their actions. And sure enough, the mom of one of the girls who I always knew as a “true giver”. . . recently shared her daughter’s college essay with me. Her daughter had written about her experiences with OHH and the art of giving. But better yet, she wrote about how helping someone else is the very best gift you can give yourself. Explore site to learn more about us and view photos of several past projects!! !